The Emerald Cup takes off Saturday and Sunday, Dec. 15–16, at the Sonoma County Fairgrounds, 1350 Bennett Valley Road, Santa Rosa. General admission opens 10am each day. $80 and up; 21 or over only. theemeraldcup.com. Northern California's premier cannabis destination for the last 15 years, the Emerald Cup has secured a place in pot history with its respected competition, eclectic entertainment and ever-present commitment to honoring organic, outdoor cannabis. For the first time, this year's Emerald Cup, taking place Dec. 15–16 at the Sonoma County Fairgrounds in Santa Rosa, is commencing in a state where cannabis is now legal for all users. While that may sound like a one-way ticket to the biggest pot party on the planet, Emerald Cup founder Tim Blake and his team have found 2018 to be anything but smooth. "It's been a very challenging legalization," says Blake. "The state wasn't ready to give out permits; people were jumping through hoops. For the Cup, we had to spend a lot of time and money on lobbyists and working with the BCC [Bureau of Cannabis Control] to ensure that we could run it the way it's always been run." With cannabis being consumed, judged in competition and purchased at the Cup, the organizers had to develop a working relationship with the new state regulators, who Blake says were not yet set up to handle the licensing and regulations required to host an event this size. The Emerald Cup last year hosted around 50,000 attendees, and this year's cannabis competition has received 500 entries. "Across the board it's been challenging, whether you're a dispensary, distribution company, nursery—it has been really something," says Blake, who estimates that only a few hundred permits for cultivation have been issued for places in Mendocino and Humboldt County, where there are more than 10,000 farmers. After spending much of the year educating the BCC about how the cannabis is judged, transported, stored, sold and consumed at the Emerald Cup, Blake is grateful to announce that all aspects of the event are still in place. "We had to make them realize this is a critical aspect to our industry," says Blake. "Not only the Emerald Cup, but all the cannabis events held around the state—small farmers depend on it." As with every year, the Emerald Cup prides itself on being an organic cannabis competition. This year, the Cup is expanding with new categories for licensed products like edibles, topicals, concentrates and tinctures, and is including a "Personal Use Grower" category, allowing an opportunity for everyone with a talent for growing cannabis to participate. 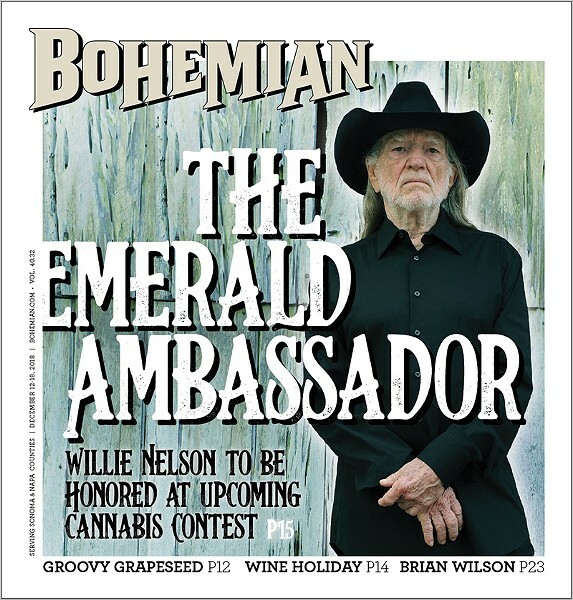 The Cup is also handing out its annual lifetime achievement award, this year honoring music legend and cannabis ambassador Willie Nelson. "Willie epitomizes the cannabis industry, the struggle we've gone through the last 50 years," says Blake. "If there's ever a person that could be called a true OG, who's been there and been openly, publicly fighting for us, it would be Willie."